The Opal stone is one of the most beautiful and mysterious players in the gemstone world. Opal rings can evoke glimmers of a summer's brightest days, bluest skies, deep blue-green seas and fiery red flowers. A Paraiba Opal ring, for example, can interplay gorgeously with eye colour, skin tone, and the neutral palette of a fall ensemble. At Rocks & Co., we have a wonderful variety of Fire Opals and Opals with colour play featured in our Opal Rings collections. The pink and yellow flashes of some of our Kalimaya Opal rings can evoke a pearlized precious pink Coral with the glimmering yellow of the sun swirled in. This ring matches fabulously with a white or grey winter ensemble. White Opal ring gem varieties have a white, cream or translucent base, also known as the background colour, and display flashes of colour play from the rainbow's spectrum of colours including pinks, blues, and purples! A white Opal can easily be set in both a white or gold precious metal setting. White Opals, also known as light Opals, can range from translucent to opaque. Welo Opal rings feature the coveted white Opal from Coober Pedy Australia, which has a mysteriously beautiful otherworldly "opalescence". Ice Opal rings feature the intense fire Opal mined in Patagonia, Chile, which is a translucent white Fire Opal without colour play, boasting an amazing ice white colour and crystallization. This stone sits beautifully in a white gold or sterling silver ring setting. Black Opal jewellery features are the most sought after in the Opal family because the black canvas of the stone creates the strongest colour play. Keep checking back with our shop for new Opal ring varieties added regularly by our gemstone hunters! The wonderful world of Opal jewellery has unique offerings of intense and electric hues! Some Opal varieties display the colour play phenomena. It is truly amazing that some of the most beautiful Opal Jewellery can be found online! At Rocks &amp; Co. we have gathered a great selection of Opals from all around the world. We are proud to be particular about our design, production, sourcing and the exclusive use of genuine materials. All of the Opal rings, Opal necklaces, Opal pendants, Opal earrings and Opal bracelets here at Rocks & Co. are carefully curated and guaranteed to be created using only precious metals and genuine Opal gemstones. In chemical terms, an Opal is an amorphous hydrated form of Silica. The structure of Opal is unique, comprised of tiny spheres of silicon dioxide forming a pyramid-shaped grid, interspersed with water. Refraction of light travelling through the spaces between these spheres creates the intense colour play. The colours are as well affected by the angle and under which kind of light from which the Opal is viewed. Each Opal has a background of clear, white, charcoal grey, etc. The additional colours, which can range from one to the full-colour spectrum, are what is referred to as the colour play factor. 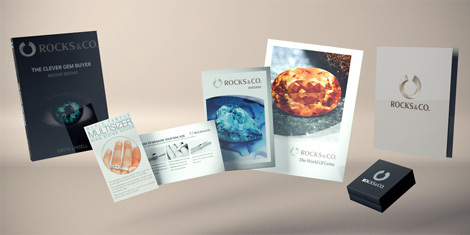 All Opal jewellery offered by Rocks &amp; Co. are delivered with the utmost care and delivered with a certificate of www.rocksandco.com/authenticity-guarantee. Opal which is October's birthstone symbolizes faithfulness and confidence. A fall oatmeal colour ensemble would be blessed to have a pair of blue Opal earrings and a necklace to bring the colour palate alive. In the past, our beautiful Opal earrings designs have included drop earrings, stud earrings, hoop earrings and more. Keep checking back in our Opal earrings selection for new gemstone additions. One of our decorative Salamanca Fire Opal bracelets is set in sterling silver. This classic beauty of a stone works with white metals such as sterling silver and white gold, but with yellow gold as well. Diamond, Zircon, and Topaz are white support stones often used in our Opal bracelet designs, increasing the luxe factor. Another beauty in our bracelet section is the yellow Fire Opal in a sterling silver tennis bracelet setting. Many of our faceted and cabochon cuts are used in this glamorous yet strong bracelet design. Javanese Opal pendant on a white gold chain makes for a perfect Opal necklace for a sweet friend, even if that´s yourself! Whether it´s Welo Opal, Paraiba Opal, Leopard Opal, Kalimaya Opal an Opal necklace is ethereally beautiful and even more so when you pair the classic clean brightness of Diamonds with the intensity of Opal. You really cannot go wrong with the jewel created with this combination. Not all Opals have ‘play of colour’. Fire Opal is a transparent to translucent crystal Opal with virtually no 'play of colour', displaying oranges, reds, and yellows, as well as recently discovered blue hues, which are mined in Buriti dos Montes, Piaui, Brazil. The intensely red, oranges and yellows of Salamanca Fire Opals jewellery set in yellow or white gold is perfect for any neutral, or even a daring primary coloured ensemble wearer. There is a wide selection of design and styles within our Fire Opal jewellery creations at Rocks & Co.